This week, Olivia and Mellie have a beautiful moment, Fitz is moving on, and Cyrus is moving out. Let’s talk Scandal, shall we? WHY DID YOU STAY? — WHY DID YOU LEAVE? 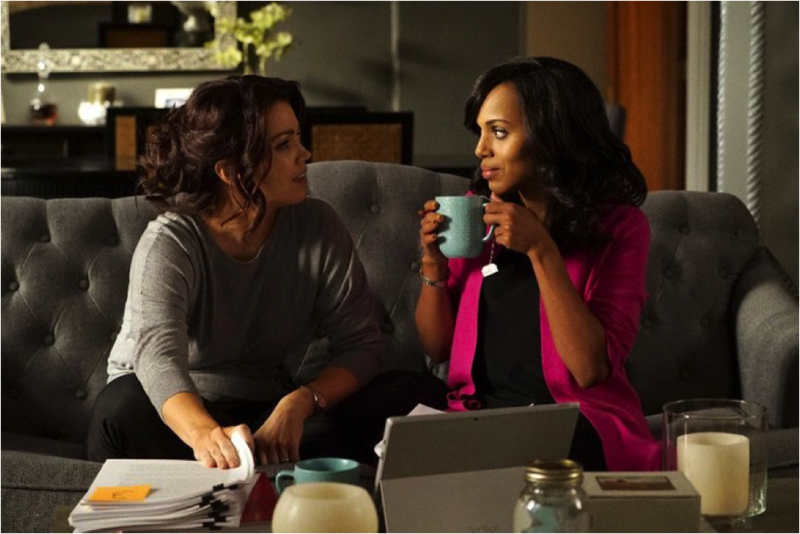 No one can push each other’s buttons like Olivia Pope and Mellie Grant. They’ve had some epic stand-offs over the years but this episode possibly tops them all. Especially because now they’re on a level playing field. Both are out of the White House, disentangled from Fitz (for the most part), and facing off as the powerful women they are. Last episode, Mellie decided to hire Olivia to help her write her tell-all autobiography. Mellie hopes that publishing her book will ingratiate herself to the American people and secure herself as the next President of the United States. She’s got a long road ahead of her. We knew Mellie and Olivia working together was not going to be smooth sailing. But I’ve long wished these two amazing women could put their differences (and Fitz) aside and become the friends and allies they were meant to be. And Shonda Rhimes did not disappoint me. Olivia and Mellie have an epic battle of wills, but then something truly lovely happens. They admit how much they’ve needed each other throughout everything they’ve experienced. They admit how much they liked having the other one around, and they move past what happened. These women are strong on their own, but they’re even stronger together. And I love the idea of Olivia helping Mellie write her book and shape her campaign. If anyone can make Mellie a president, it’s Olivia. I’ve always been a fan of Shonda’s ability to craft beautiful, authentic female friendships and I really hope this is the beginning of a beautiful friendship between Mellie and Olivia. Meanwhile, there’s a new reporter in town and she has her sights set on Fitz. Her name is Lillian Forrester, and apparently she’s interviewed everyone from the Pope to Putin, and she even has a Pulitzer. You wouldn’t know any of this from the way she conducts herself around the President though. There is nothing that irritates me more in shows than an accomplished, intelligent, professional woman who dissolves into a nonsensical puddle around a man she has a crush on. If we’re supposed to buy that this woman is a cutthroat reporter who takes no prisoners, then why would she not be able to handle herself like a professional around the leader of the free world? Shonda Rhimes is better than this kind of drivel, so I’m going to give her the benefit of the doubt and assume that this Lillian Forrester has something else up her sleeve. I’m going to assume she’s planning to blackmail Fitz or try to poison him, or something — anything really — that is more interesting than just exploring a schoolyard crush. Either way, Fitz asks her on a date after she blubbers her way through admitting she has a huge crush on him during their interview. So, I guess we’ll get to see this date play out next episode. Ugh. Gross. Whatever. At the beginning of this episode, Cyrus is trying desperately to convince Fitz to make the most of his last few months as president — to do something meaningful. Fitz seems pretty uninterested in doing anything but calling poor Abby at random hours of the night, drinking very expensive Scotch, and dating problematic characters that have appeared out of nowhere. Cyrus has dealt with the big baby that is Fitz for decades at this point, coddling him and shaping him into the president he is now. Cyrus has been disrespected and fired by Fitz multiple times. He’s lied and cheated and coerced and killed for Fitz. Fitz is his whole world. So it was rather shocking when Cyrus walked out of the White House and walked out on Fitz. One thing’s for sure: Cyrus always has a back-up plan. And his backup plan this time just happens to be a young Mexican governor from Pennsylvania, who is as of yet nameless. Poor guy probably has no idea what will happen once Cyrus sinks his teeth into his campaign. After five years of mentions and take-out orders, we FINALLY get to see the inside of a Gettysburger! David Rosen and Susan Ross going on a date there was not only super cute but also fulfilled my intense need to see the gloriousness that is Gettysburger. From the employees’ outfits to the color scheme to the “Freedom Fries” and “Union Rings,” it was everything I thought it would be — and more. I also hope David and Susan’s first date, surrounded by Gettysburger’s special brand of magic, will help David finally drop Elizabeth North once and for all and focus on becoming the man Susan deserves. I truly think the reason David continues to be with Elizabeth — a woman he can’t stand — is because he thinks that’s who he deserves. And he’d be right. He doesn’t deserve someone as awesome and good as Susan. David used to be just like Susan when Scandal first began: idealistic and naïve and good. But five years of being an unofficial gladiator have taken their toll and he’s fallen from grace, at least in my eyes. He needs to step up and become the man that Susan already thinks he is. That’s my take on this week’s Scandal. I’d love to know what you all thought of Fitz’s new love interest, the Susan-David date, and Mellie and Olivia’s new-found friendship.